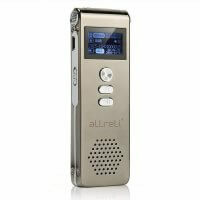 View basket “aLLreLi CP0260 Digital Voice Recorder” has been added to your basket. dB9PRO Voice Activated Digital Recorder with USB – 8GB / 96 Hrs Capacity Mini Sound Recorder – Audio Recording Device with Microphone! with 2 Lanyards & E-Book! Never Miss Another Word! ✅ NEVER MISS SOMETHING IMPORTANT AGAIN! Have you ever appeared in a test and wondered when your teacher even covered those topics in class? Or what about that time you missed an important assignment you were handed at a business meeting, but you plain forgot? Of course, it didn’t really help that in all those situations that they were speaking at 200 words per minute, so how could you have kept up anyway? Just let our dB9PRO recording device help you remember what is important to you!  THE BEST WAY TO TAKE NOTES: Did you know that no matter how fast you are, whether you write or type, you can only capture about 20-30% of what is spoken? You are also missing the full sensory experience of what is being shared. With our dB9PRO voice recorders, you never have to miss a thing, so you can capture 100% for easy review afterwards! Get more productivity out of your meetings and classes by taking notes with your new listening device.  AMAZING GIFT IDEA! Our premium dB9PRO sound recorder makes an amazing gift for students, journalists, musicians, poets, lawyers, business professionals, and even to record a cute song sung by your child to listen back to years later. Our voice activated recorders can hold 8GB of data, or 48 hours of audio, with a battery life of 7-10 hours. Please use Windows Media Player for Windows 10, or VLC Media Player for Mac.